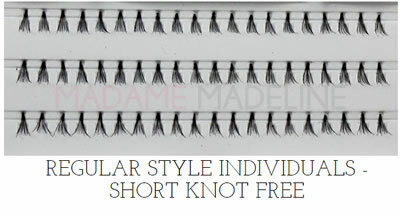 Add length and volume with these lush knot free individual flares short lashes by ModelRock. These easy to use knot free flare short lashes have no knot at the end of each cluster for most natural look like your own lashes. ModelRock Regular Style Short Knot Free Individuals are lightweight and natural looking to add instant volume and thickness to thin lashes. Customize your eyes with as many lash clusters as you like. Start lash application in the middle of upper eyelid and work your way out, spacing individual lashes or lash clusters sporadically in between my natural lashes for totally natural look.